As a working artist for over three decades, I find keeping interested in painting involves challenging myself. Sometimes this means new subject matter or new materials. Even a new location helps. The challenges keep me inspired and allow the mental juices to flow. 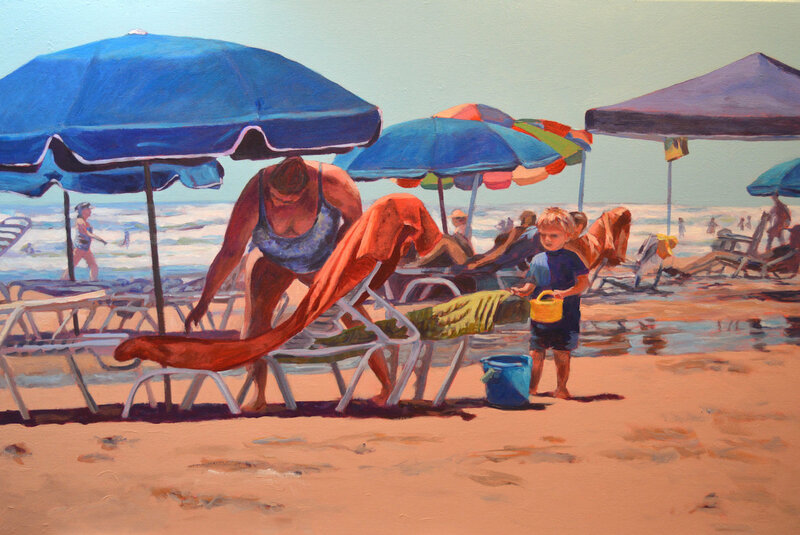 My latest challenge is painting a series of paintings revolving around a day at the beach. I love slice of life subjects, catching people going about their lives without thought of an audience. One thing I’ve noticed is that when people are at the beach, they stake out their territories, bringing the chairs and the umbrellas, the coolers and the toys. Beach goers seem to operate under the illusion that no one can see them in their little sand kingdoms. But the artist’s eye can. The planned series includes vignettes of life at the beach. Families, couples, kids playing, people just enjoying the sunshine…or totally ignoring their surroundings with their noses in books or napping. My inspiration for these seaside paintings are John Singer Sargent, Joaquin Sorolla, and Burt Silverman. It took a lot of effort to make their seaside paintings seem so, well, effortless. Unstaged even though they often were. And that is the aim of this current series that I’m working on. The painting above depicts the settling in and establishing of territory by a family. Mom gets the lounge chairs ready while son is waiting patiently for her attention. The composition with overlapping umbrellas and tents is like a little city, each with its own slice of life. The beach walkers and people playing in the surf add distance and perspective to the scene. I also chose to flatten the color of the sky (no clouds) and the foreground. This allows the emphasis to be placed on the middle plane where all the action is. A Day at the Beach is number six in the series. I have sixteen planned but we’ll see. A series is an exploration of an idea and I’ll keep at it until I don’t have anything else to say about the subject. If you’d like to see how this painting was created, click on this link or go under the tab Artworks and click on A Day at the Beach for step-by-step photos.